5th Royal Irish Lancers V.C. Private Clare, an Englishman serving in the 5th Royal Irish Lancers, was awarded the V.C. for bravery in trenches at Bourlon Wood, 28th November 1917. Known as Billy his parents lived in Plumstead, South-East London, but he lived with his grandparents in Anchor St, Chatteris (which was renamed Clare St in his honour). Formerly of the Bedfordshire Imperial Yeomanry with whom he served for eight years, he registered for National Reserve on the 29th January 1914 subsequently being sent to Remounts, France before allocation to the 5th Royal Irish Lancers. On 28th / 29th November 1917 at Bourlon Wood, France, Private Clare, now a stretcher-bearer, dressed wounds and brought the wounded to the regiment's dressing station under most intense fire. At one period, when all the garrison of a detached post had become casualties he crossed to them through very heavy fire and, having dressed all the cases, manned the post single-handed until a relief could be sent. Then, after carrying a seriously wounded man through intense fire to the dressing station, he went, still under heavy fire, to every company post warning them that the enemy were using gas shells. Unfortunately this brave soldier was subsequently killed later during the day. He was aged 28. His VC is publicly displayed at the The Queen's Royal Lancers Regimental Museum (Belvoir Castle, Lincolnshire, England). A stained glass window was placed in the south side of Chatteris parish church in his honour, depicting Christ rewarding a faithful soldier; it was dedicated in Sept 1918. This account of his actions was written by James Price Lloyd of the Welsh Regiment, who served with Military Intelligence. After the war, the government to destroyed all the archives relating to this propaganda (section MI 7b (1)). They were regarded as being too sensitive to risk being made public. Remarkably these documents have survived in the personal records of Captain Lloyd. 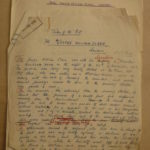 Many of these papers are officially stamped, and one can trace the development of many individual articles from the notes based on an idea, to the pencil draft which is then followed by the hand-written submission and the typescript. The archive "Tales of the VC" comprises 94 individual accounts of the heroism that earned the highest award for valour, the Victoria Cross. These are recounted deferentially and economically, yet they still manage to move the reader. Date stamp: 1_ January 1918. Born: May 18, 1889 in St Ives, Huntingdonshire.